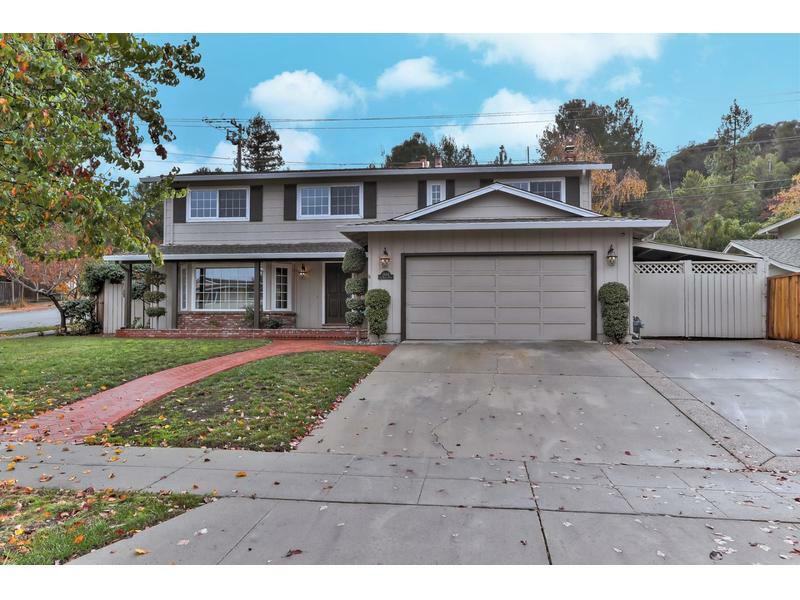 charming almaden home that is part of the wonderful montevideo neighborhood. this updated, move in ready home offers 5 bedrooms, 2 and 1/2 bathrooms and sits on a corner lot, at the top of the neighborhood, on the beautiful tree lined de palma drive. this home has hardwood floors, updated kitchen w/gas range, custom cabinets with plenty of storage, wood burning fireplace in family room offering surround sound for your entertainment. updated bathrooms, two upstairs bathrooms have skylights for extra brightness. closet organizers in bedrooms. indoor laundry room. beautiful sliding doors are your gateway to a park setting backyard offering a corner gazebo, hillside seating and beautiful stone patio. oversized side yards on both sides. there is nice storage in the garage above with pull down ladder for easy access to your personal items. don't miss out on this wonderful opportunity to live in this fabulous maintained and lovely home in a neighborhood you will feel right at home in.